In the last few weeks I'd been having some trouble with the Yaesu FT-8900 radio which I have in the car. When switching it on, it displays the DC voltage and I'd noticed that it was very low. Under 11v with engine off. I've got the FT-8900 wired up the way that every instruction manual ever written tells you not to - through a cigar lighter plug. 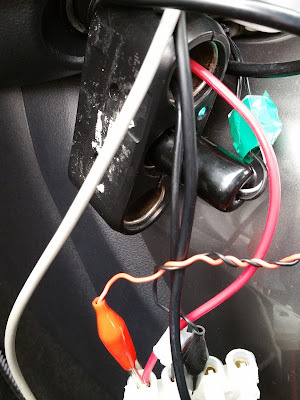 This is not usually a problem, I've never had a radio connected any other way in the car and never used over 20 watts mobile from the FT-8900. Also, the radio is transmitting APRS while I'm driving, with around a 1% duty cycle and 20 watts. At first I thought the car battery was not charging and would soon be completely dead, but I did a check with the engine running and the voltage did go up, so the alternator was OK. 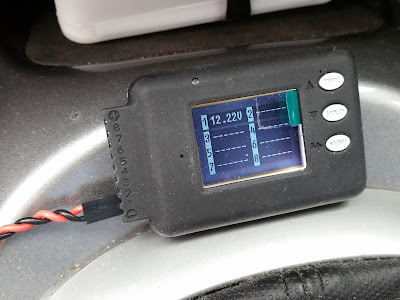 The voltage while charging did seem a bit low, maybe 12.8v. This was while I had the radio on receive, but when switching it off, the voltage went up to the normal 14-ish. That's a big voltage drop for something drawing under 1 amp on receive. I checked the voltage drop between the negative wire on the radio and the car body, and it was very low. It turned out the connection between the lighter plug and the socket was bad, because there was something that looked like a burn mark on the centre contact of the socket. Something had probably knocked the plug out slightly and the resistance had increased. I cleaned the contacts up and the total voltage drop with 20 watts transmit power is around 0.3v (including the wiring from the battery). With the engine running, there must have just been enough voltage at the FT-8900 to let it transmit (or at least look like it was - nobody picks me up on APRS round here anyway!). I'm guessing below about 9v the radio will shut down. One other thing I learned from all this is that the Nissan Juke (and probably lots of other cars) doesn't keep the battery charging all the time when the engine is running. This is something I'd never thought of before, normally you would leave the engine running if you wanted to power something that might drain the battery - like a high power transmitter. After starting the car, the alternator is connected to the battery, but once the battery voltage reaches a certain value, it cuts off when the car thinks it is fully charged. Now this is a problem because I don't think the "fully charged" voltage is really fully charged, and it just replaces what energy was used the last time the car was started, and then cuts off. Searching online, I found that this is a known issue with certain Nissan Jukes and the batteries never charge properly. It also effects add-on lights which detect the battery voltage to switch on when the engine is running. Putting a load on the battery (the headlights usually work) can switch the alternator back onto the battery as the car sees a voltage drop and thinks the battery needs charging. Wiring to radio and APRS tracker. The FT-8900 cable is soldered directly inside the 3-way splitter. The APRS tracker is on the lighter plug, so I can disconnect it when not wanting to transmit data.